I am about to become "that girl." You know, the one with REALLY ugly shoes that don't match her outfit? Haha!! Really, I am though. I watched a special on The Doctors over Spring Break about how women are killing their bodies with heels and super flat flip flops with no cushion or heel or arch support. Even wearing the wrong size or style of tennis shoes for your specific form of activity can cause major problems with your spine, posture, bones, joints, etc. I typically choose my shoes if based on two criteria....1)cute 2)cheap. I do pay more for tennis shoes because I work out a lot....Yea, that's my big splurge. (Well, I usually get them as Christmas or birthday presents from my honey.) I know people say you don't have to give up style for comfort and support, but there really aren't a lot of reasonably priced brands that provide adequate foot support and that are cute. Does anyone else have this issue?? I think they're dorky, but I'm really leaning toward getting some Shape-Ups. I wonder if they work??? I do have to say I think the Reebok brand Easy Tones look better and are cheaper. See, there I go again choosing style & price over my foot health. So, I think I might should look into some. Eva Mendes makes them look good. Then again, she could wear a terd and make it look beautiful. Typically at school I wear heels and change into my slippers while I'm in my classroom (they could pass as regular shoes). I might do a similar thing with the tennis shoes....because they certainly don't go with my teaching wardrobe. I say NO to the shape-ups unless I see back up research on them really working AND your booty is perfect! HAHA! I also think they are NOT cute! OH MY WORD - I just think you are cooler than that! HAHA! Hope you had a great day back! I work for the hospital in Gainesville and ALOT of nurses and front office staff wear shape-ups. Although, they are not the cutest shoes, I can vouch that they work. They give the same feeling as walking in the sand barefoot. There are alot of shoes that you can wear (not all of them are ugly). I know there is a store by the Mall of GA that fits you for shoes .. they have all types. Good luck!! I wish i had some suggestions.... I am in the same pickle... on my feet all day at work wearing ballet flats with 0 support... but they dont hurt my feet like heels do. I wear asics which I think are one of the world's ugliest running shoes, but they feel pretty sweet on my feet! Working in a pharmacy for what often turns into 12 hour shifts i can pretty much tell you there is no shoe that is going to fit style, comfort, and price :-/ but what i have discovered is clarks are pretty good and not too expensive (usually on sale at belks or dsw) and a good pair of solid colored gym ahoes look decent even with dress pants. A lot of people i work with swear by dansko - they are a nursing shoe and cost over $100! I personally didnt care for them much. Good luck!! I have shape-ups! I wear them to walk to the park with and can feel a burn. Really though they make you walk properly which is great for your posture and such! I agree with danielle about getting solid tennis shoes. I did that when we went to Paris b/c I knew we'd have a TON of walking but we had to dress nice for business functions and no one could even tell. Plus how often do you see your shoes in pics? 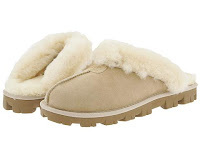 My fav shoes now are ballet flats :) and the world's BEST slippers are the "wicked good slippers" from LLBean. A-MAZING! check out danskos and merrell has some realllly cute 'barefoot' shoes. i have those too. i like them both...and the shape ups. no ma'am! Well since your about to become "That Girl" hahah... I guess I will share with you what my hubby suggest. He swears by "BROOKS"!!!!! I have the Easy Tones by Reebok I can tell a difference when I wear them compared to my other tennis shoes. I only paid $50 for them at Kohls a few months ago. I really like them :).